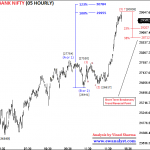 Bank Nifty again opened slightly higher at 22573 and traded with huge strength for rest of the day. Bank Nifty bounce by more than 700 points to register new all time high 23267 and finally closed 654 points up at 23190. Bank Nifty was expected to bounce sharply above 22978 because of Complex Correction in my last analysis report and suggested to buy Bank Nifty 29 Jun 23000 call till further update. 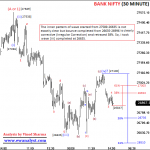 Bank Nifty bounced above 22978 and registered high 22267. 29 Jun 23000 call bounced till 408 and gave more than double profit. Now, we need to analyze latest charts for next move. 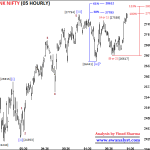 A Complex Correction is completed at 22469 from where a new impulse has been started. I need to check wave counts of previous move again, so today I am showing move from previous high 22978 and previous wave counts I will explain in my Monday’s report after checking carefully this weekend. This is 15 Min chart of Bank Nifty covering move from all time high 22978. A Complex Correction (most probably Triple Zigzag) seems completed from 22978-22469 as I was expecting and new Impulse has been started from 22469. 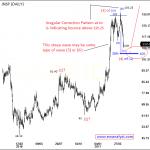 Bank Nifty gave a very wild move after breaking out from Triple Zigzag pattern as expected and same is the personality of Triple Zigzag Correction. Next impulse started from 22469 is sharp and fast, so I am analyzing this wave separately on 5 minutes chart. This is 5 Min time bar chart of Bank Nifty Covering move from 22469-23267 which I am expecting as start of new impulse. The wave started from 22469 looks like a sharp impulse which is within its wave 3, wave 2 of this impulse is negligible. Wave 3 may have already completed at 22267 or still in progress. 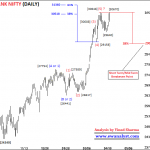 Wave 4 and 5 of this impulse is still pending so Bank Nifty still has scope for higher levels. 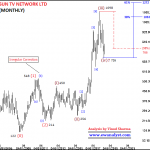 38%-61% projection of this whole move (calculated from 23117) is placed at 23421-23610. 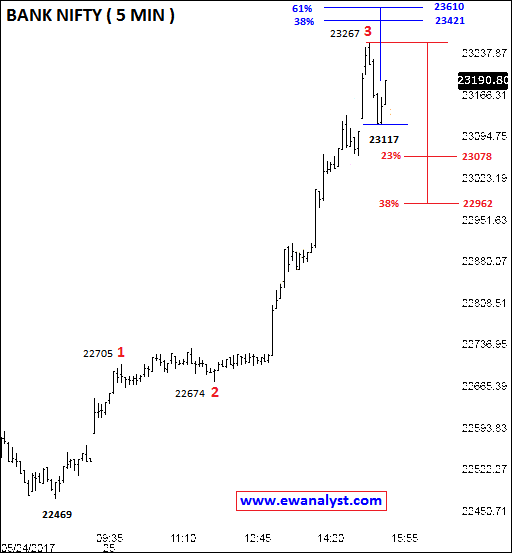 23%-38% retracement of whole move is placed at 23078-22962. So, 38% retracement 22962 can be referred as Reversal points or stoploss for any longs. 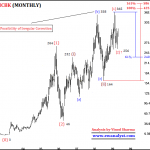 I am calculating 38% retracement of whole move because wave 2 is negligible. 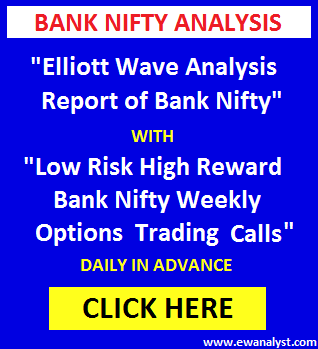 Bank Nifty bounced sharply above 22978 after completion of Complex Correction exactly I expected in my last analysis report and 29 Jun 23000 Call which suggested to buy gave more than Double Profit. Bank Nifty bounced by more than 700 points yesterday but still has scope for higher levels because the wave seems within wave 3 whereas wave 4 and 5 is still pending. 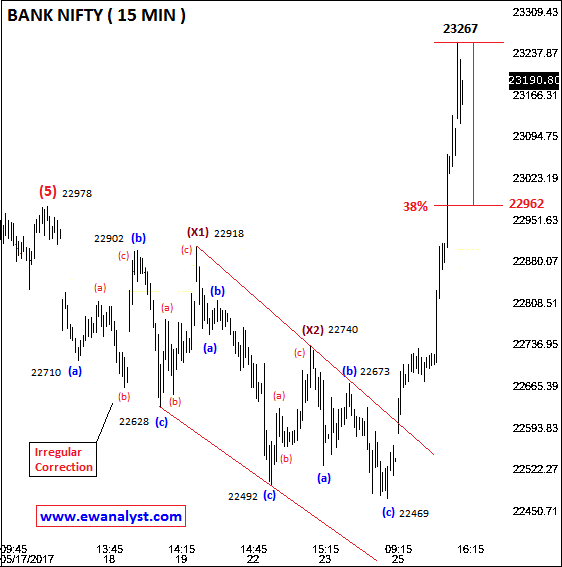 Casually, Bank Nifty still has possibility to bounce higher towards 23421-23610 whereas exact levels can be calculated after identifying the completion of wave 4. On downside, 23078-22962 is the range from where Bank Nifty can bounce again for higher levels and 22962 can be taken as reversal point and stoploss for longs. 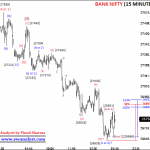 Bank Nifty already bounced by more than 700 points and wave 3 seems near to completion. So, profit must be booked in 29 Jun 23000 call as it is already giving more than double profit and wait for next opportunity to initiate fresh trade. Bank Nifty if decline towards 23000-22962 can be bought again in this range with stoploss of 22929 expecting targets above 23267 again. YOU ARE SIMPLY SUPPERB SIR… PERFECT WORDS YESTERDAY AND BANKNIFTY TOUCHED YOUT TGT IN SINGLE SESSION… HOW? 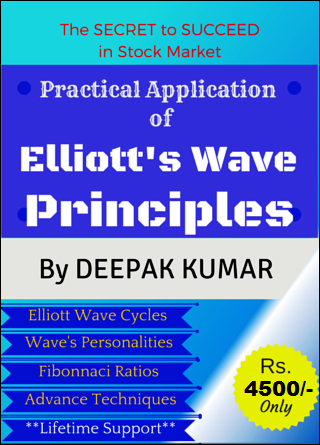 I MEAN IF SOMEONE FOLLOW MKT THIS PRECISELY MEANS HATSOFF TO YOU SIR… PERFECT WAVE STRUCTURE… I WANT TO KNOW SOME DEEPS OF EWAVE LIKE SOME FIX RULES KIND OF. LIKE 4 CAN’T ENTER IN 2 TERRITORY LIKE WISE BUT SOME KET RULES WHICH ARE NOT AVAILABLE IN ANY BOOKS.. LIKE YOU HAVE SAID BANKNIFTY CAN TOUCH NEW HIGH AND IT DOES IT SAME DAY…. SIMPLY SUPPERB…. BUT HOW SIR? RULES OR SOME TRACK THAT THIS MAY HAPPEN…. FINALLY, I SINCERELY THANK YOU FOR YOUR REPORTS WHICH HELPS EVERYONE….